Mines are one of the most used weapons in modern warfare. They are simple and cheap, can be easily mass-produced and can inflict terrible damage to persons and equipment. Well-placed minefields can stop the advance of entire armies or force them to pass through prepared points were the defence can be concentrated. The traditional way to deal with mines was (and many times still is) their individual localization, whether with metal detectors or manually with some sort of probe (such as a bayonet) and their deactivation or controlled explosion. These are dangerous and very slow methods, and the quick and mechanized modern warfare, such as the developed during WWII, required faster and more efficient procedures. Germans made extensive use of mines during WWII, especially when the tide of war turned and they were forced to a defensive role. Nevertheless, It is curious that the German were probably the belligerent nation that dedicated a lesser effort to the development of specialized mine clearing vehicles, with only some strange prototypes built, such as the Minenraummer. 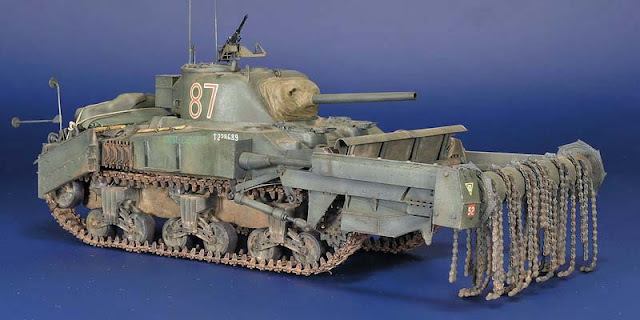 On the other hand, both Russians and Western Allies did develop operational devices, carried on tanks, devised to neutralize many mines in a relatively short time, creating cleared corridors in a minefield through which the advance could progress. The British contribution to these specialized vehicles was the Sherman Crab. The principle was simple: a rotary drum with multiple chains attached which impacted on the ground causing the detonation of the mines. First essays on this kind of flail device were performed in the North African desert, using Matildas as carrier. These had the drum at one side of the tank and an external engine delivered the power for the flailing drum. The development culminated two years later in the Crab Mk II, for which, only M4A4 (Sherman V) were used. The failing device was placed in front of the tank, supported by two arms and took the power from the tank engine, through a connection in the transmission. The arms could be elevated, for a travel configuration or depressed for the mine clearing operation. Two containers of chalk were installed at the rear, in both sides, in order to mark the cleared lane. The tanks retained their 75 mm guns, which were useable while not flailing. The Crabs were concentrated in specialized units. For example, Crabs were equipping all the regiments (22nd Dragoons, 1st Lothian and Border Yeomanry and the Westminster Dragoons) of the 30th armoured brigade, one of the units of the famous 79th armoured division, as part of their very specialized engineer equipment, and took part in the Normandy battles from the very beginning. The optimum use of the Crabs involved the participation of the whole troop of five tanks (each regiment had three troops) as a whole. Three Crabs advanced side by side in echelon, clearing a lane about 8 meters wide, while the other two were in reserve supporting them with their guns. Nevertheless, it is sure that individual Crabs were used to clear narrower lines when needed. Life was not easy inside a Crab while flailing. Earth, stone and debris were projected all over blinding the crew, who had to rely in an internal compass to direct the tank. Also, flailing had to be done slowly, and thus the Crab were an easy prey for antitank firing if not properly covered by other tanks. In fact, the casualties of Crabs were quite high during the war, about 25%. Las minas son una de las armas más utilizadas en la guerra moderna. Son artefactos simples y baratos, se pueden fabricar en masa con facilidad y son capaces de infligir un daño terrible a las personas y vehículos. Bien ubicados, los campos de minas pueden detener a ejércitos enteros, o forzarles a pasar por lugares preparados, donde se puede concentrar la defensa. La forma tradicional de combatir las minas era (y en muchas ocasiones todavía es) su localización individual mediante detectores de metales o de forma manual con algún tipo de sonda (como una bayoneta) y su desactivación o explosión controlada. Estos métodos son lentos y muy peligrosos, y la guerra mecanizada moderna, tal como la que se desarrolló durante la segunda guerra mundial, requiere métodos más eficientes y expeditivos. Los alemanes hicieron un uso extensivo de las minas durante la segunda guerra mundial, especialmente cuando cambiaros las tornas y se vieron obligados a tomar una actitud más defensiva. Sin embargo, es curioso que Alemania dedicara muy poco esfuerzo al desarrollo de vehículos especializados en la destrucción de minas, con solo algún ejemplo esporádico como el extraño prototipo del Minenraummer. Por contra, rusos y aliados occidentales desarrollaron sistemas instalados en tanques, destinados a neutralizar gran cantidad de minas en un tiempo relativamente corto y crear corredores seguros para continuar el avance a través de los campos de minas. La aportación británica a estos vehículos especializados fue el Sherman crab. El principio era simple, un tambor giratorio con multitud de cadenas que golpeaban la superficie del suelo detonando las minas. Los primeros ensayos de este sistema se llevaron a cabo en desierto del norte de África, usando Matildas como portador. El tambor era accionado por un motor externo y estaba situado a un lado del vehículo. 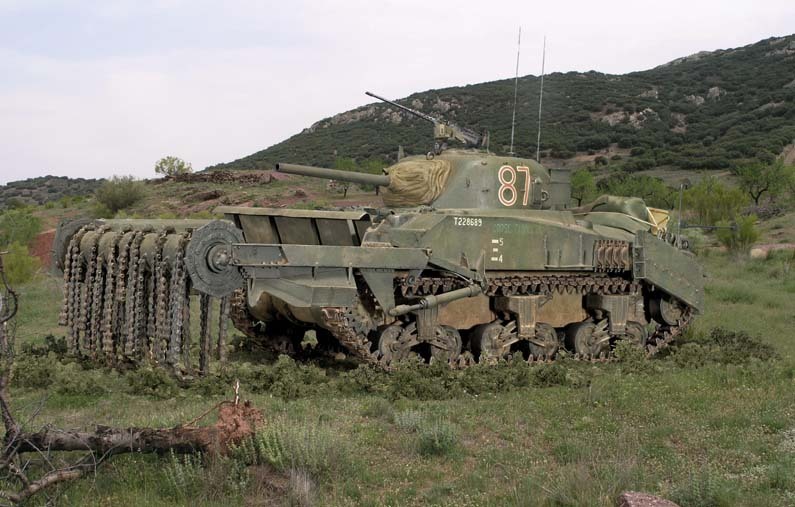 El desarrollo culminó dos años después con el Crab (cangrejo) Mk II, para el cual se utilizó in M4A4 (Sherman V). El tambor se situó en la parte frontal del vehículo, sujeto por dos brazos, a era accionado por el propio motor del carro mediante una conexión en la transmisión. Los brazos podía ser levantados durante el viaje o bajados cuando se llevaban a cabo las operaciones de limpieza de minas. Se instalaron dos contenedores con cal a cada lado con objeto de marcar la linea desminada. Los carros conservaban su cañón de 75 mm que podía ser utilizado mientras el tambor no estuviera en funcionamiento. Los Crabs fueron concentrados en unidades especializadas. Por ejemplo, los Crabs equipaban los tres regimientos (22nd Dragoons, 1st Lothian and Border Yeomanry y Westminster Dragoons) de la trigésima brigada acorazada, una de las unidades que formaban la famosa 79 división acorazada, como parte de su equipo de ingenieros especialistas, e intervinieron en los combates den Normandía desde el principio. El uso óptimo de los Crabs involucraba a los cinco carros de cada pelotón (cada regimiento tenía tres pelotones) como un conjunto. Tres Crabs avanzaban simultáneamente, uno junto a el otro de forma escalonada, limpiando un carril de unos 8 metros, mientras que los otros dos permanecían en la reserva, proporcionando protección con sus cañones. Sin embargo, en ocasiones los Crabs se usaron de forma individual para limipar carriles más estrechos si era necesario. La vida no era fácil dentro de un Crab mientras funcionaba el tambor. Tierra, piedras, polvo y otros escombros volaban en todas las direcciones cegando a la tripulación que tenía que confiar en una brújula interna para guiar el carro. Además, el trabajo de desminado era lento, con lo que el vehículo se convertía en un presa más fácil para el fuego anticarro si no estaba apoyado adecuadamente por otros tanques. De hecho, las bajas de los Crabs fueron bastante altas durante la guerra, hasta un 25%. El Crab estaba lejos de ser perfecto. La detonación de una mina casi siempre suponía la destrucción de al menos una cadena. Cuantas menos cadenas quedasen en el tambor, menos efectiva era la limpieza, y por lo tanto mayor era la posibilidad de quedara alguna mina sin explotar. No era extraño que una de estas minas fueran pisadas por el propio Crab inmovilizándolo en una situación apurada. Además, no se recomendaba el uso del sistema sobre terreno blando (playas, barro...) debido a que las cadenas acababan cavando una zanja en la que el mismo Crab acababa atascado. En suelo no llano, la eficacia del sistema también disminuía considerablemente En cualquier caso, los Crabs fueron usados de forma intensiva en Europa e Italia en 1944 y 1945 y fueron máquinas apreciadas, incluso por los americanos, que tomaron algunas prestadas de sus aliados británicos. This model was built in 2005 and was my fourth serious Sherman. In some way it was a reflect of the time and involved a heavy kitbashing. The newest Dragon or Tasca Shermie weren’t still out and earlier kits greatly benefit from the combination of parts from different sources. The basic kit used here was the now very old Dragon “M4A4 with 60 lb rockets” (ref. 6041) kit. Well, in fact, only the hull (corrected in length and with the addition of the missing weld beams) was used and other items listed below replaced the rest of the parts. 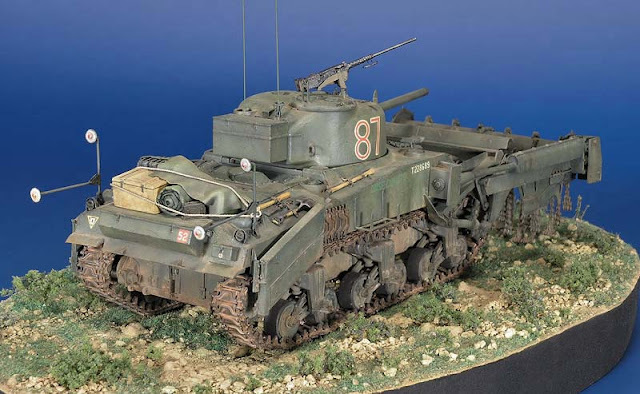 The running gear provided in the kit is not adequate for a M4A4, since it features the bogie with the raised return roller arm, whereas this mark of Sherman carried the flat style arm. I used Academy’s bogies and wheels, which have the correct flat arms, and some additional details, such as the three screws at the bottom. The Academy bogies were detailed with the PE Aber skids, to which the four bolts have been added, and with the four holes used to bolt the arms in the opposite side if necessary. 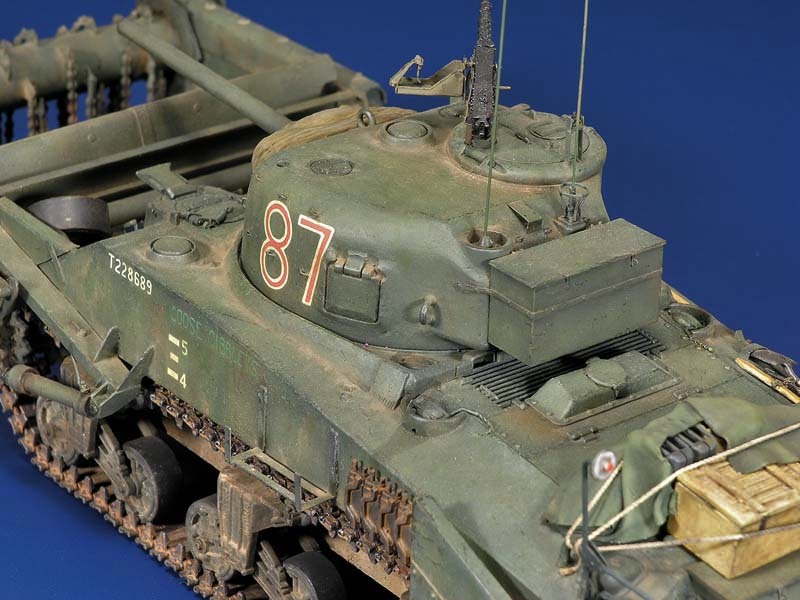 The tracks I used came from RHPS and are of the T54E1 type. I replaced the kit turret with a Tamiya M4 one, which I had as a spare from a previous Sherman Project. This low bustle turret made by the Japanese company has a better overall shape than the Dragon one. The commander hatch is the one provided in the kit and the aluminium turned barrel is from the Jordi Rubio range. The main Crab conversion was from Resicast (ref 35133). 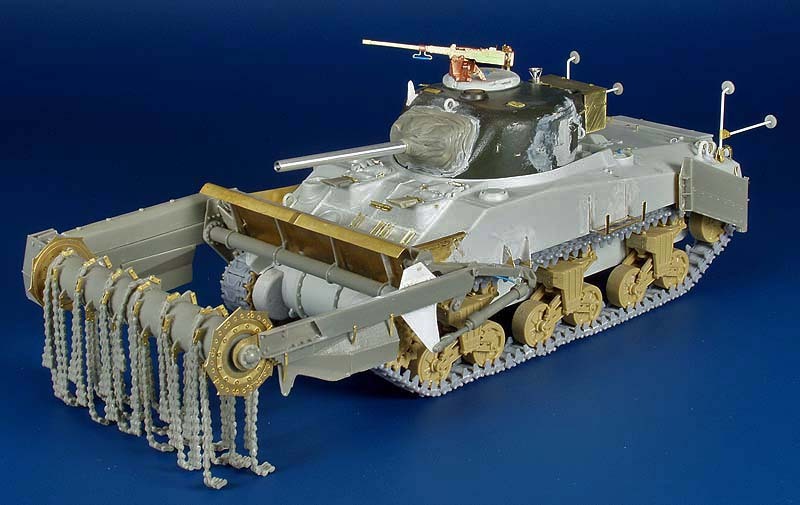 It provides resin and photoetched parts, as well as some lengths of plastic rod necessary to transform our plain Sherman V into a Crab. The resin parts are nicely moulded, with excellent detail and bubble free. Nevertheless, this is not an easy conversion and I found the instructions to be no too good. It was necessary to double-check the position of the parts (not very clear in the instructions), and to correctly align the arms of the rolling drum and the fit of all the associated parts. Otherwise, the building could become a nightmare (believe me, I know) and I even manage to damage some parts. Also, a tricky part is to bend the chains to represent their natural weight on the ground. I did that heating the resin chains in my desk lamp bulb. Anyway, I broke several of these chains, but fortunately the conversion provides many extra ones. At the end I had to use them all in the flailing drum and I finished with none to put in my model as spares as frequently seen in photos of wartime Crabs. Other add-ons I used in the Crab are Verlinden resin pioneer tools (ref. 1476), Custom Dioramics cal .50 MG (ref. CD2003) and Aber PE set for the M4A4/Firefly (ref. 35033). As you can see, not quite an “out of the box” building. 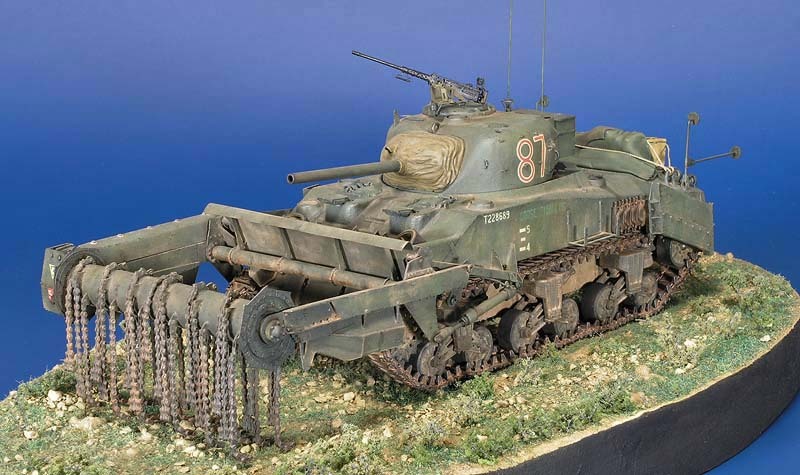 Hice esta maqueta en 2005 y fue mi quinto Sherman "serio". 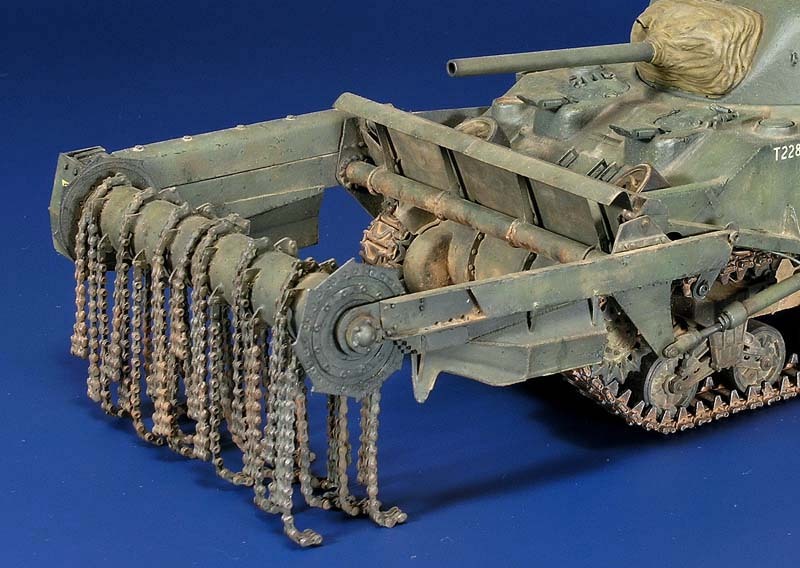 De alguna manera, esta maqueta refleja es estado de la situación para los Sherman a escala en aquella época. Los nuevos y excelentes Shermans de Tasca o Dragon todavía no habían salido al mercado y los kits disponibles por aquel entonces requerían para su mejora del añadido de diversas partes procedentes de otras fuentes. Aquí utilicé el viejo “M4A4 with 60 lb rockets” (ref. 6041) de Dragon. Bueno, de hecho de esta maqueta solo utilicé el casco (corregido en longitud y con el añadido de todas las líneas de soldadura). El resto de las piezas tuvieron otra procedencia. El tren de rodaje de la maqueta es erróneo y tuve que sustituirlo por otro de Academy, que si representa el brazo recto para el rodillo de retorno en sus carretones. Además añadí los patines superiores en fotograbado de Aber, con sus correspondientes tornillos y los agujeros en los carretones. Las cadenas con del tipo T54E1 y son en plástico eslabón a eslabón de la marca RHPS. Reemplacé la torre por otra de Tamiya que tenía como sobrante de otro proyecto. La torre de Tamiya tiene unas formas más correctas que la original de Dragon. La escotilla doble del comandante es la de Dragon y el cañón de aluminio de Jordi Rubio. La conversión principal para el Crab es de Resicast (ref 35133). Consta de piezas en resina y fotograbado, así como algunos trozos de alambre y varillas de plástico. El moldeado de la resina es bueno, con abundante detalle y sin burbujas. El montaje no es, sin embargo, sencillo, ya que hay que chequear continuamente el alineado y posición de las piezas, especialmente de los brazos que sujetan el tambor giratorio, y las instrucciones no son particularmente claras. Un paso peliagudo consiste en doblar las cadenas para representar su apoyo natural sobre el terreno. Yo lo hice calentando la pieza en resina con una bombillas, pero no pude evitar romper varias de ellas. Otro añadidos utilizados en la maqueta fueron herramientas de Verlinden (ref. 1476), ametralladora calibre .50 de Custom Dioramics (ref. CD2003) y fotograbado de Aber PE para el M4A4/Firefly (ref. 35033). Como puede verse, bastante alejado de una maqueta "de caja". The base painting of the model was done with Tamiya acrylics, and the weathering with filters, oils, washes and pigments. The decals came from the excellent set “WW2 British Shermans, part I” made by Bison Decals (ref. 35010). This set includes, among other vehicles, decals for two Crabs. I chose “Goose Giblets”, a Crab for the 1st Lothians and Border Horse Yeomanry, 30 Armoured Brigade, 79 British Armoured Division in Europe during 1944 and 1945. 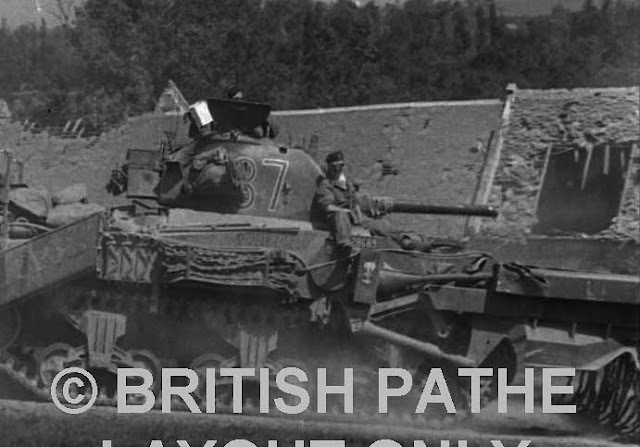 This vehicle can be seen in a wartime footage sequence available at the British Pathé website (www.britishpathe.com, film ID 1994.03). La base de la pintura esta hecha con acrílicos de Tamiya, y el envejecido y ensuciado a base de filtros, óleos, lavados y pigmentos. 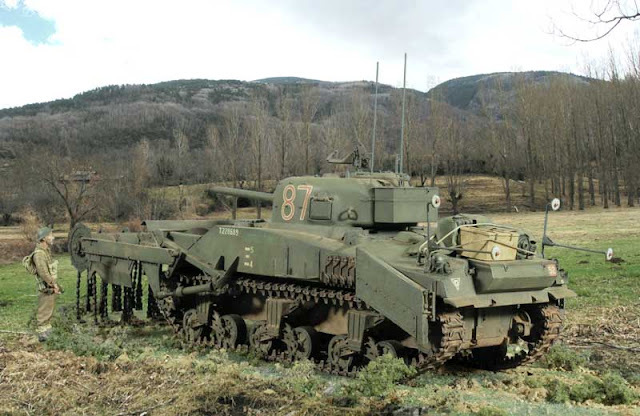 Las calcas proceden de una excelente hoja de Bison Decals, “WW2 British Shermans, part I” (ref. 35010). Entre otras, este juego incluye calcas para dos Crabs. Yo elegí “Goose Giblets”, un Crab del 1st Lothians and Border Horse Yeomanry, 30 Armoured Brigade, 79 British Armoured Division en Europa en 1944 y 1945. Este vehículo puede verse en un película documental hecho durante la guerra en el sitio web de Pathé (www.britishpathe.com, film ID 1994.03).